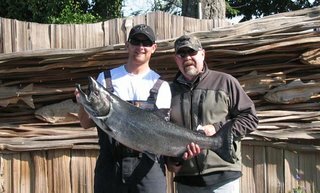 There are still reports of decent salmon and halibut fishing around Sooke. It's typical Fall weather...meaning it changes every 5 minutes. However, the last couple of days have been BEAUTIFUL....sunny, calm seas, warm midday...perfect fishing weather. For halibut, people are chasing them right off the Sooke Bluffs, or out towards Jordan River or Constance Bank. Halibut fishing continued to be the anglers choice this past week. Hali’s are being caught from west of Sooke to Victoria. East Sooker Teague Griffin pooned a 50-lber off Beecher Bay on the weekend. Anglers are finding a spot on the chart or map and throwing out the pick, as in anchor or drifting on a good tide with depths from 60 to 250 feet will produce. Stick and stay and make it pay is the Hali way. As for salmon fishing the Sooke Bluffs to Otter and beyond in the 120’ to 180’ line should be productive. More and more anglers are getting dialed into fishing for salmon and when the currents suits them they switch over to the Hali show, making the opportunities of a day on the water very rewarding. Crabbing remains good with some nice keepers being taken. Remember crabs have to be 6 1/2 inches across the back with a limit of four crabs per person a day and females have to be released. Nine days left til the all new Sooke Harbour Marina Chum Derby which runs from Oct. 31 to Nov. 9. There will be some special events taking place at times during this 10-day event. For more info call 250-642-3236 or sookeharbourmarina.ca. It's that time again: making chums of chums. The fish of great numbers that return this time of year in so voluminous schools that they are hard to believe, are here. Sooke River has turned on, the Nitinat has so many it's hard not to tread upon them, and for saltwater guys, try Seymour Narrows north of Campbell River. For saltwater trolling, try hootchies before a blade. Many different hootchies do the trick, including: the Googly Eyed Wild Thing, a local concoction that you can buy in Campbell River, and shades of purple, pink with white spots, pink and blue, blue, pink, bubble gum and the coastwide rage: Purple Haze. Plankton sizes in pink and purple are consistent backups. Leaders should be 33 inches. Flasher choices include blue and purple and Purple Haze. Because the waters are ultra-clear this late in the season, Plaid flashers with their 3-D effect make sense. What you are looking for, surprisingly, is a bright sunshine, blue sky, high-pressure system day. These chum bite more frequently on high pressure days on a flooding tide. Closer to Victoria, in the Sooke Basin, on foot fishing can be had at Billing's Spit. It is a good place for gear chuckers to cast Buzz Bombs, Stingsilda's and other lead-weight lures that are retrieved: lift, drop and reel, lift. Find the most jumpers and cast among them. The rising tide is better than a falling tide, but both will pick the fish up and deposit them on the opposite, or 'downstream' side in a back eddy. Where you see the most fish is where to fish. Above the silver bridge on the Sooke River is considered freshwater and retention is not allowed. You must also fish with fly rods, etc. The All Sooke Day's Park has open fishing, as in a spacious lawn, and you are looking for mornings, late, and any time in-between when the estuarial fish come on in their bite. At the bottom of the lawn is a mud reef. Stand back from the water, making the fish zone only about two- feet deep -- resist that temptation to walk right in as it pushes the fish out; then up at De Mamial Creek where fish taste the water and stop. On high tide days, follow the fish up as they will be lifted right at the head of the tide. A medium, nine-foot (2.9 metres) tide will lift them a half mile more. Access this from the trail and parking spot up from the De Mamiel bridge. And on higher days, keep on trucking up with the fish, all the way to the cliff corner, run up stream and Martin's pool just above. Good colours this year have included purple and egg-sucking leeches (even a small blob of pink yarn on the hook of your fly will induce a bite) -- any peaty river makes pink and purple standouts. There's fun to be had! Get out there and enjoy it, before the winter rains come!